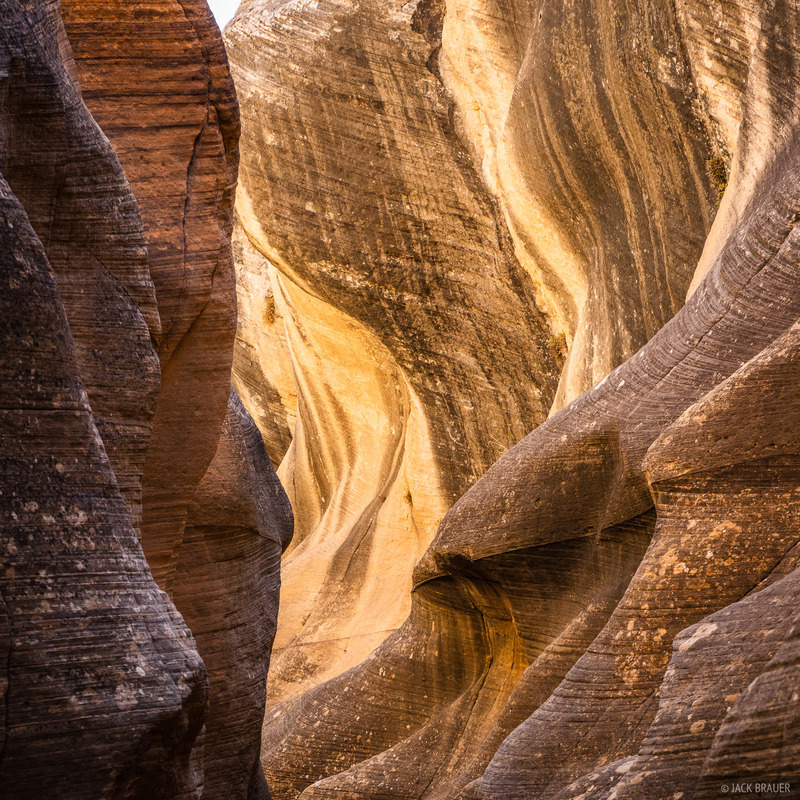 In mid April we hit the road again for more desert time, and spent a week camping and hiking through various narrows and slot canyons in Grand Staircase-Escalante National Monument in central southern Utah. This has long been one of my very favorite parts of Utah and I was happy to return and check out a bunch of canyons new to me. This was also the first time I've returned since the monument size was controversially reduced by 46% last year, and I have a few words to say about that below along with the usual trip report. For our first trip we drove 40 miles down the rough Hole-in-the-Rock Road for a one-nighter backpack loop down one canyon and back up another. 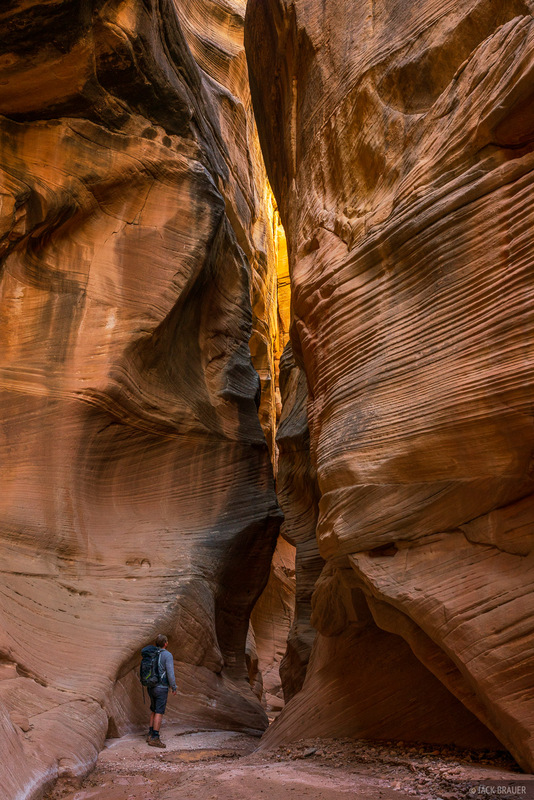 The Hole-in-the-Rock area is arguably the heart of the Escalante area with many famous canyons around here. 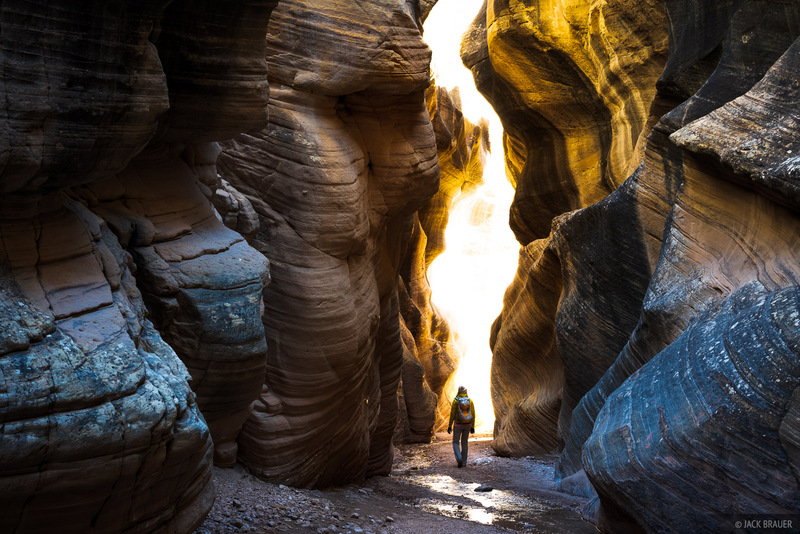 While driving the road it doesn't seem super spectacular, but that's because all the amazing stuff is hidden out of sight down in the canyons, and you need to hike or backpack to see it! 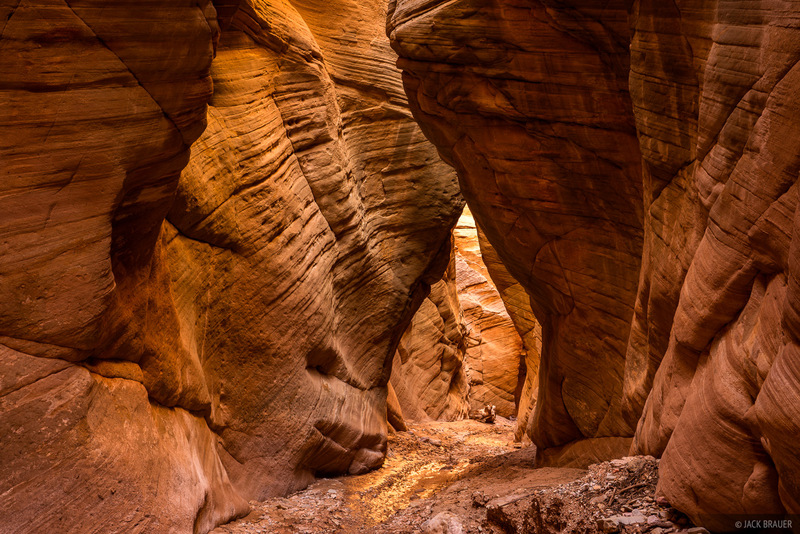 The trailheads here are/were located in Grand Staircase-Escalante National Monument but these two canyons themselves are within the boundaries of Glen Canyon National Recreation Area. 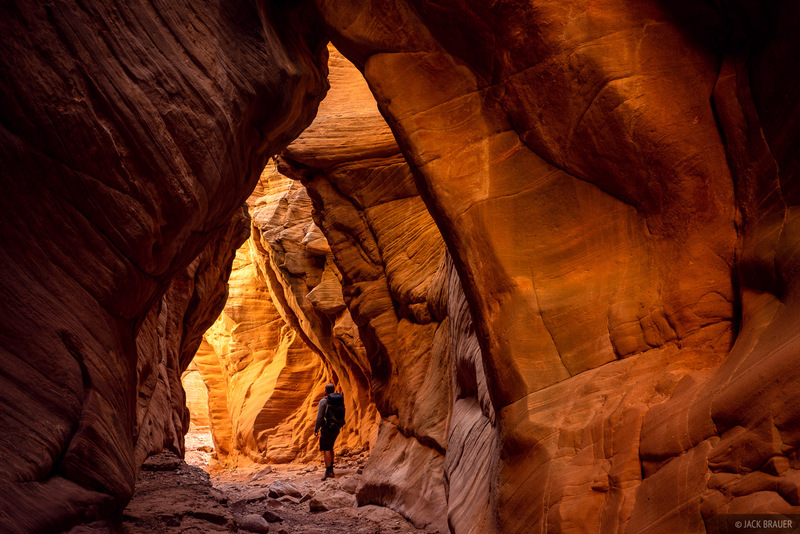 (Recently in 2017 the entire Hole-in-the-Rock Road corridor was removed from Grand Staircase-Escalante National Monument when President Trump reduced the size of the monument by 46%; more on that below). 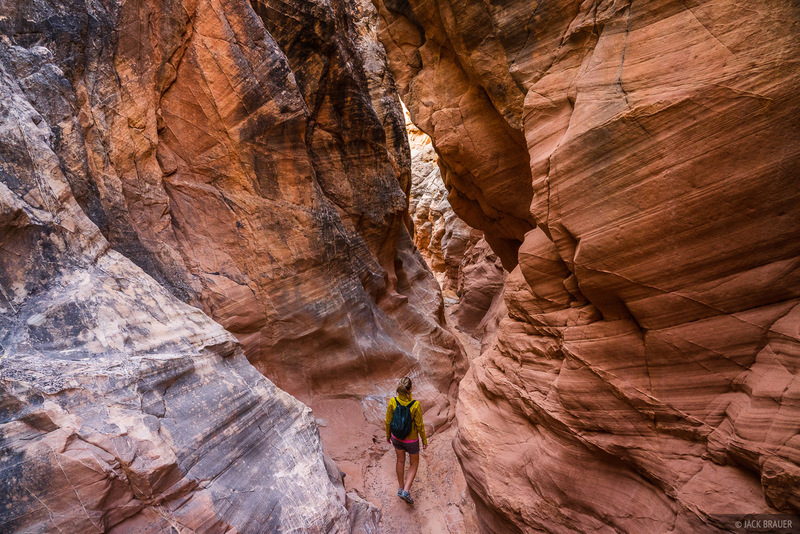 After hiking down a fairly nondescript wash, the canyon quickly became much deeper and narrower, eventually coming to a series of deep pools which we had to wade through. Super fun! Neoprene socks and trail runners are key for wet canyons like this, and we wore them on just about every hike we did this week. 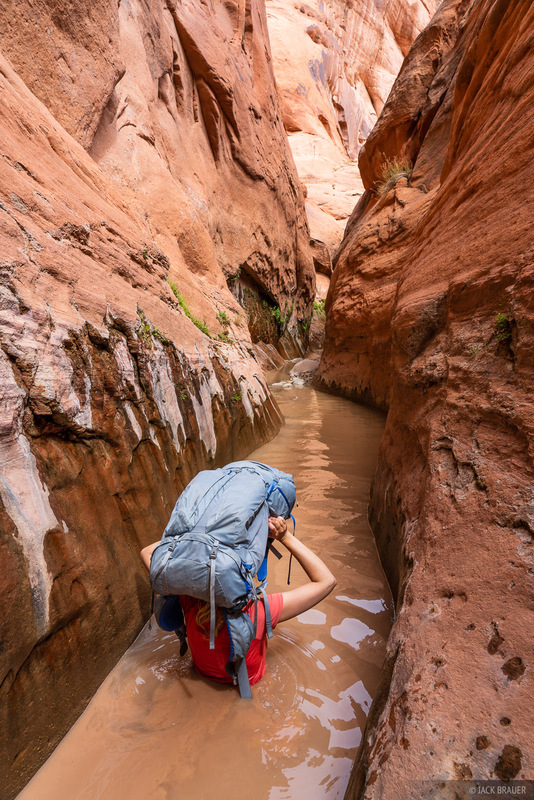 We splashed through all the pools for what seemed like forty miles down the canyon, then got to a junction and turned up a more willowy creek eventually arriving at a massive arch that almost resembles a broken bow. 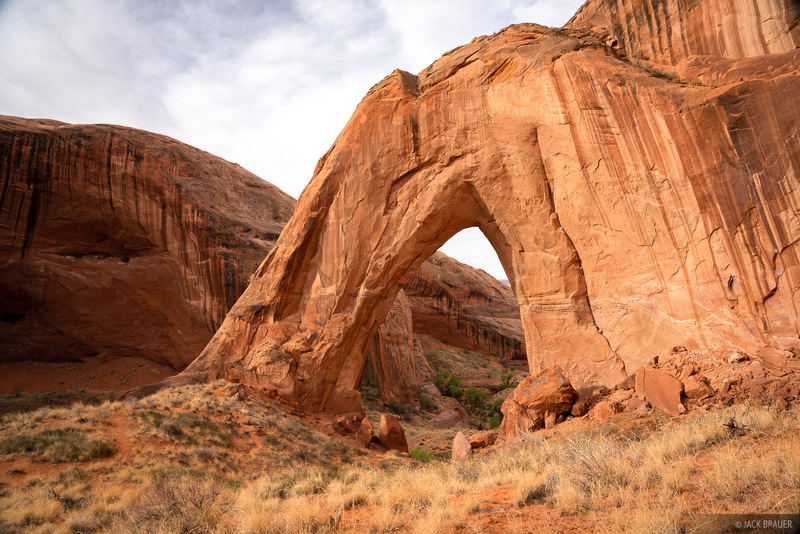 A mega arch in Glen Canyon National Recreation Area. Near the arch we found a great slickrock campsite. Not only is camping on slickrock nice for walking around barefoot or in socks while our wet shoes dried, it is also the best place to camp to leave no impact on the land. In a popular place like this it's imperative to camp responsibly to not trash the area or disturb other hikers. 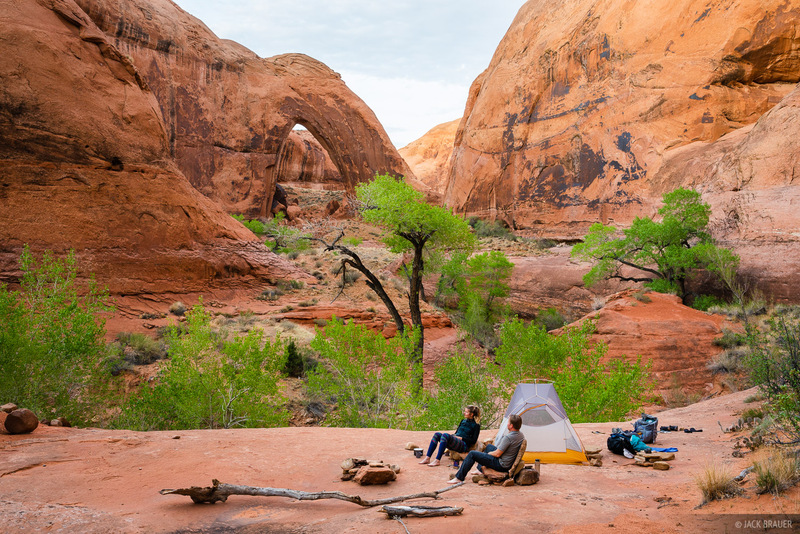 A fantastic slickrock camp complete with rock lounge chairs. We could have done this loop as a long day hike, but the picture above shows why I love camping out so much! The whole experience soaks in so much deeper when you have a whole evening to relax, reflect on your day, and meld with the wavelength of the place. 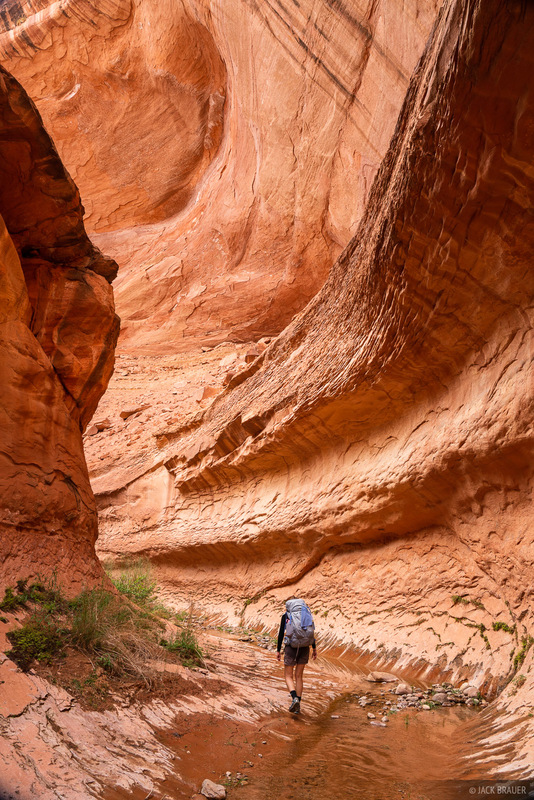 After hiking out the next morning, we drove back towards the town of Escalante and hiked into a lesser-known canyon network southeast of Escalante. 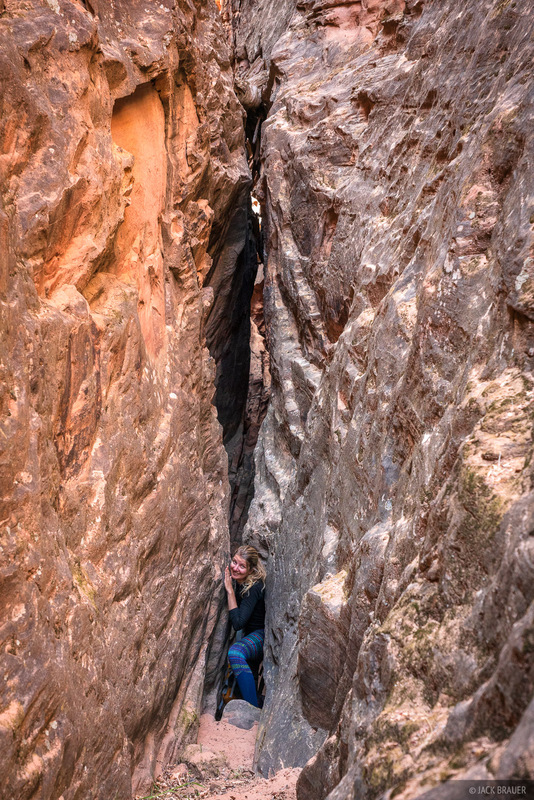 Claudia climbs through a narrow crack in the canyon. I say canyon "network" because this unique canyon area consists of one main canyon with lots of parallel side slot canyons branching off perpendicularly like downtown streets. The slot we used to enter the canyon was very narrow, requiring lots of scooching and downclimbing through tight cracks while pulling our backpacks behind. Down in the main slot, we hiked and scrambled as far as we could until we got to a murky deep pool. I waded through one disgusting cess pool only to be blocked soon after by an even deeper one with a impassible [for me] chokestone. Oh well, it was fun while it lasted! "Moqui marbles" are small rock balls that cover areas of whiter Navajo Sandstone in many parts of Grand Staircase-Escalante National Monument. 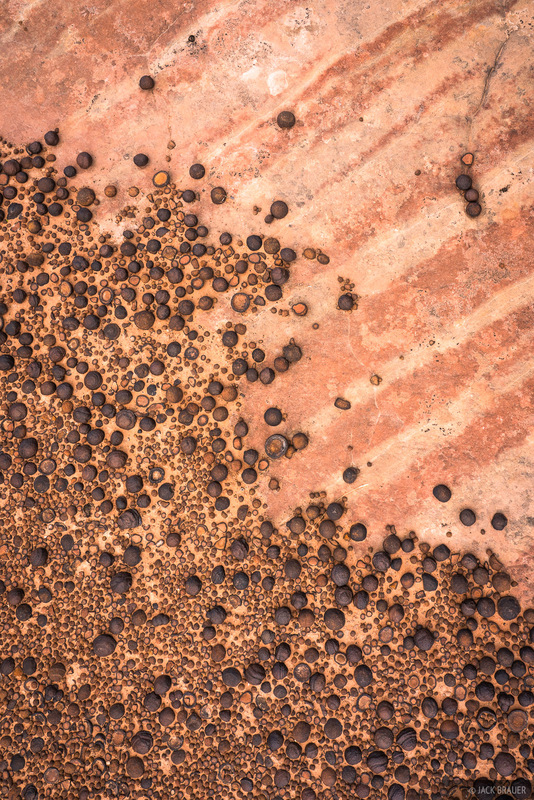 These balls are composed of hard iron oxide outer rings surrounding a softer sandstone core and were formed underground around 2-5 million years ago when iron materials precipitated from flowing groundwater. Red sandstone gets its color from iron oxide that coats the sand grains; in white sandstone the iron oxide was dissolved by certain hydrocarbons or acids flowing through the sandstone, which then precipitated in certain spots forming the marbles. Once the softer sandstone eroded over the eons, the harder marbles were left on the surface. According to Hopi legend, the Hopi ancestors' spirits return to Earth at night to play marble games and leave them there in the mornings to reassure their relatives that they are happy and content. Similar but smaller concretions called "Martian blueberries" were discovered on Mars in 2004 by NASA's Mars Exploration Rover Opportunity, providing some of the first evidence for water in Mars' ancient past. Just like in Escalante, the "blueberries" were found scattered on the ground and embedded in rock outcroppings. Read more about Moqui marbles here. The whole area here is covered with Moqui marbles, and I had lots of fun photographing these unique geologic oddities. After our day hike here we drove to Escalante for the obligatory beer and calzones at Escalante Outfitters (always a treat after a canyon outing) and then continued west through Cannonville for a few days of hiking canyons off the Skutumpah Road. Here's another region potentially affected by Trump's recent monument reduction - everything north of Skutumpah Road got the axe. 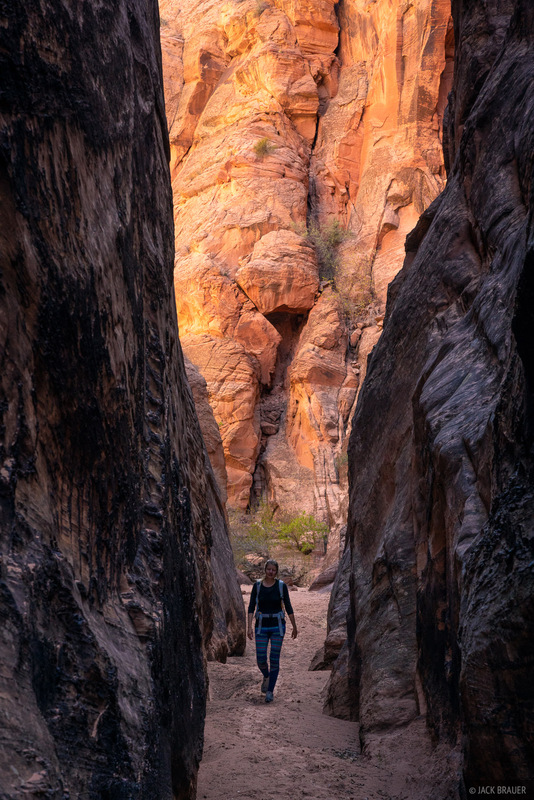 Light at the end of the tunnel in Willis Creek. 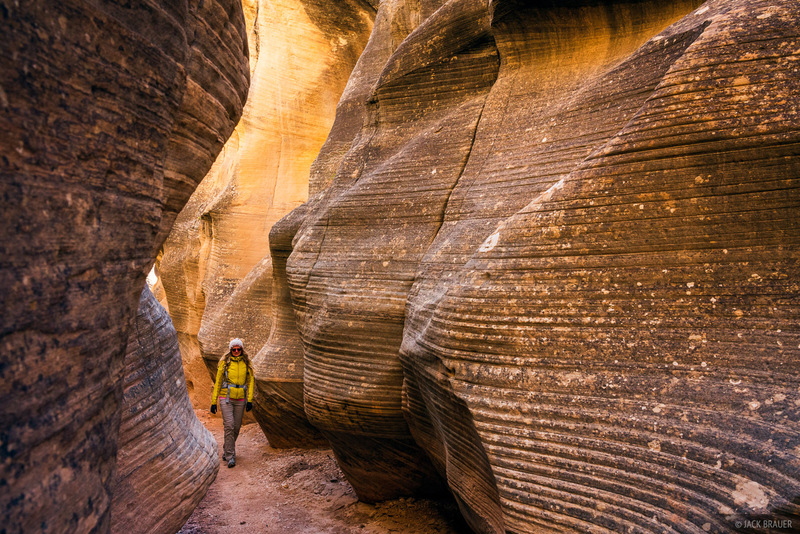 After an easy but enchanting walk through Willis Creek we hiked into a less popular but much more massive and challenging canyon nearby. It took us a few hours just to find a route down into the canyon, then the canyon bottom almost immediately started presenting obstacles. Claudia [being the wiser of us] wasn't into it and returned to the truck, but I pressed on. Lots of mud, lots of wading, lots of climbing over chokestones, and lots of wading then climbing over chokestones in the water! I knew there was another entrance up-canyon that I could probably climb out of, so I kept going and finally/barely made it through and out the canyon. It turned out to be one the most challenging adventures I've done in a long time, complete with muddy legs and bloody elbows and knees! Sometimes it feels great to push your boundaries a bit and this one felt pretty badass for me! (By the way, you'll know this canyon if you've seen the old jeep that's crushed between its upper walls). 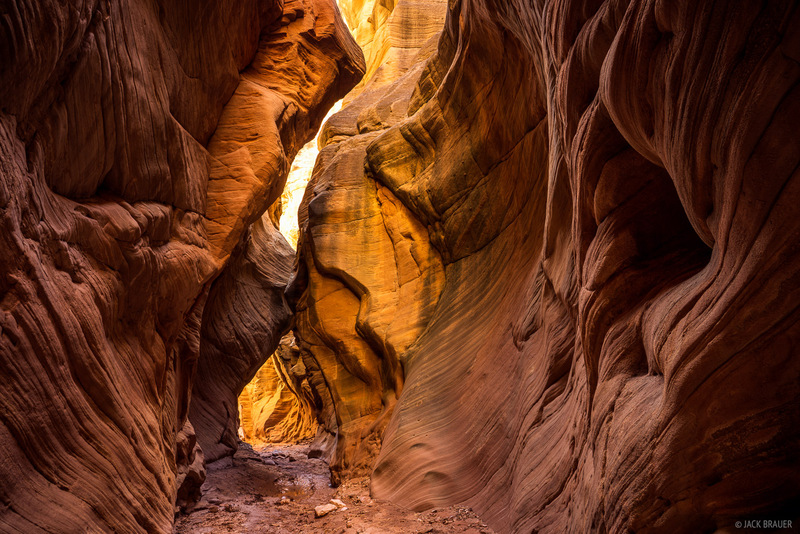 The three photos above are now technically outside the new Grand Staircase-Escalante National Monument boundaries, along with 46% of the monument land which was also excluded when President Trump declared a reduced size of the monument in 2017. That is, if the monument reduction is not overturned in court, which I hope it is. The last time that a president has declared a major reduction of a national monument was Woodrow Wilson and the Olympic National Monument in 1915, over 100 years ago, and this is the first time a reduction has been challenged in court (the law allows presidents to declare national monuments but not to un-declare or reduce them). It would set a horrible precedent if Trump's reduction is upheld in court. What's the point of the presidential power of declaring national monuments if the next president can just negate it? The reason this is important specifically in Grand Staircase-Escalante is because some of the areas removed from the monument boundaries are potentially rich in coal and/or uranium deposits, so without the monument protection those areas are now open for mining leases along with all the accompanying industry roads, traffic, and pollution. If you, like me, are disturbed by this outrageous movement in the wrong direction, please consider donating to groups that are currently fighting this in court, including the Southern Utah Wilderness Alliance and The Wilderness Society to name a few. We'll see how this all shakes out in court. 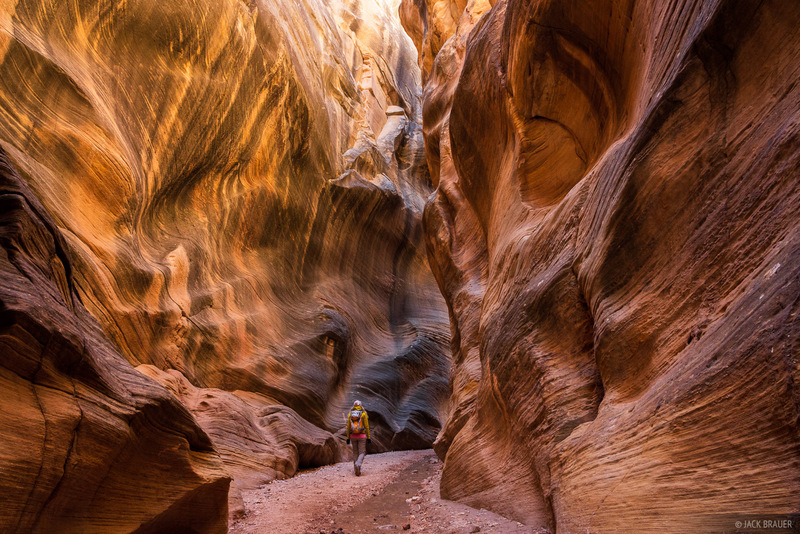 Also, I think it's worth mentioning that this whole national monument controversy would be moot if Congress would pass the Red Rocks Wilderness Act which would designate much of Utah's pristine and spectacular canyon lands as official wilderness areas, thus safeguarding them from development with the firmest level of protection for future generations. Read more about the Red Rocks Wilderness Act here. Another reason to vote for leaders who care about public lands more than fossil fuel industry campaign financing. Hiking in Upper Cottonwood Wash Narrows. 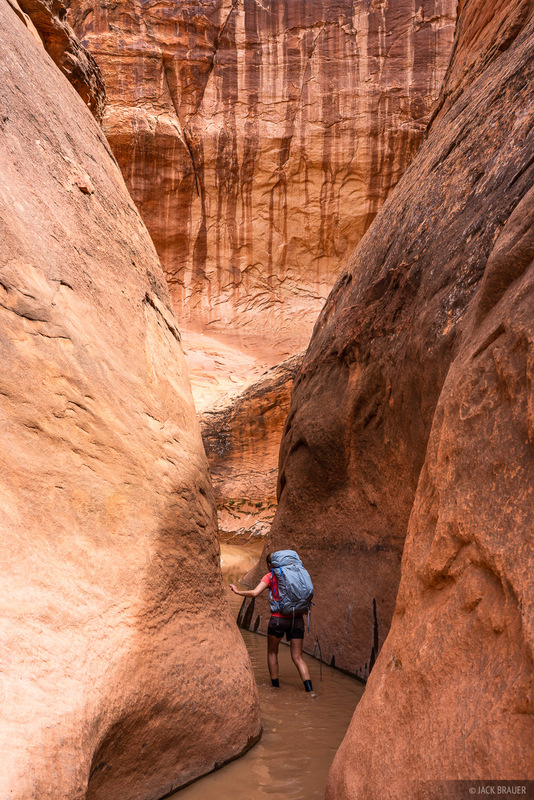 Continuing on from my rant, we headed southward from the Skutumpah Road area down the Coxcomb and Cottonwood Creek road where we spent a few more days hiking short and easy narrows, including the Upper Cottonwood Wash Narrows and lower Hackberry Canyon, wrapping up a fantastic week in the Escalante region!